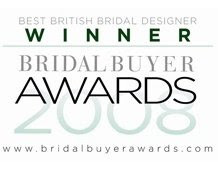 Jenny Packham has just been honoured as Best British Bridal Designer at the Bridal Buyer Awards 2008. Perceived as one of the authorities in bridal and eveningwear elegance on an international level, Jenny Packham’s resolute and revolutionary vision has contributed to a redefinition of the bridal market. Jenny Packham's beautiful gowns are available at Helen Rodrigues.